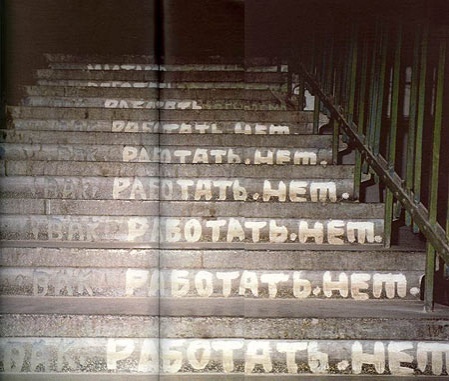 One Russian guy in Kharkov, Ukraine preferred was obsessed with some idea which he tried to express in writing on any flat surface he met. All his flat carried his scriptures, the local lobbies and walls of houses also had not stayed untouched. What is the true definition of an ART?don`t think every thing which is out of the “box” is not an art.art is the feeling of soul.don`t try to encircle the inner eye. 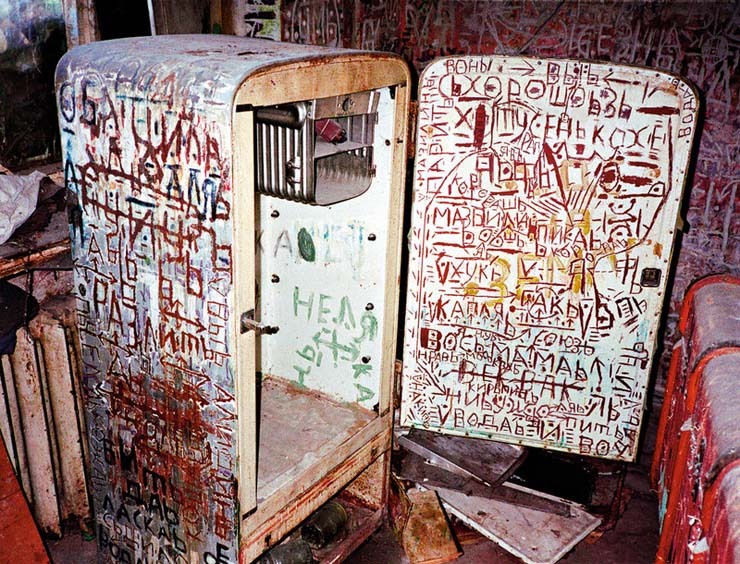 I like the frige – it’s graffiti you can eat-ee! I see someone in a lot of PAIN.. However, with this, I see art. He missed writing on the floor. Its a condition known as graphomania,an overwhelming compulsion to write.Its very interesting.I wish i could translate it. Okay,so now I’m getting a mental image of a little boy being told by an overbearing mother,”You are not normal,you are sub-human.You’ll never belong.You’ll never amount to anything.”This is of course pure supposition,but if this were the case,then the writer has certainly left traces of himself in this world,and an indelible image in my mind. Kak eta strashna! Bozhe moi, bozhe moi. Znachit…esli bi ya znal on, ya bil’ bi skazal “zakusovat’ nado!” Xa, Xa, xa! 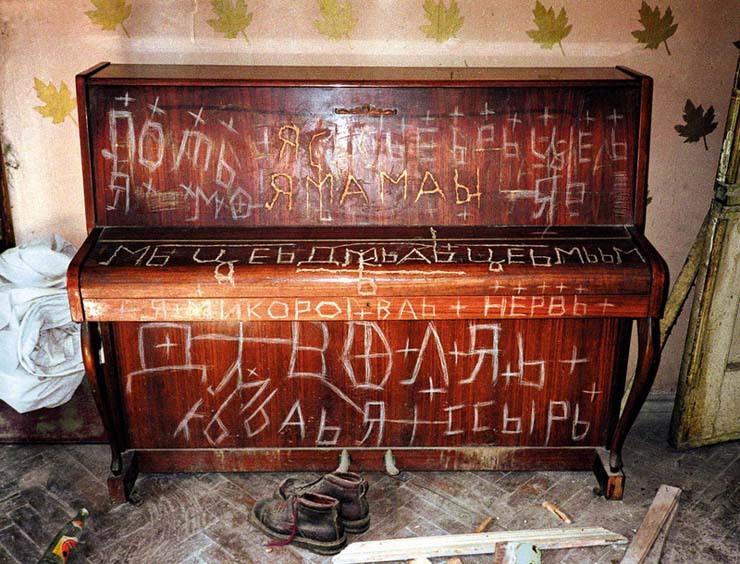 I know he’s from Kharkov, but my god…can he decide to write in Ukranian or Russian? Both of them together (or just poor spelling) makes me crazy. The guy is a famous madman in Kharkov – Oleg Mitasov. Is he just a crazy? That’s explain all this raving. The cyrillic looks so much cooler than latin does. I think they abolished the death penalty in Russia about 10 years ago, you can go cry now. I think they abolished the death penalty over 10 years ago, I guess you can go cry now. Similar to the character in the film “A Beautiful Mind”? 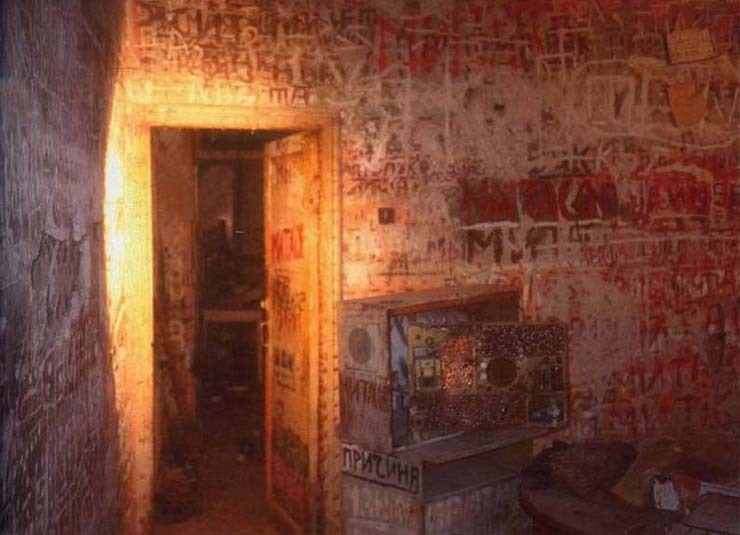 The guy who paint these walls was brain “washed” by kgb.almost half of his brain was removed from his skull! ! ! ! .remaining half was not able to think and act like average person, so he colored meaningless characters. I have a friend who has been drinking every day since 1993. His apartment will soon start to look like this. I was wondering what do the words on the last photo say? It feels like something from a horror movie. Has Sasha Sokolov met this guy? I smell sequel! I hate to be so picky, but in Kharkov, Ukraine, chances are he’s a Ukrainian guy not a Russian guy, especially since so much of the writing is in Ukrainian and not Russian (cross my heart, there’s a BIG difference)! Horror vacui, my god. I like it as an installation piece, but I can’t believe anyone can live there without permanently damaging their eyes. This guy owns stock in the marker company…….make write on walls…….make markers go empty…..buy more markers…..more markers make stock go up! 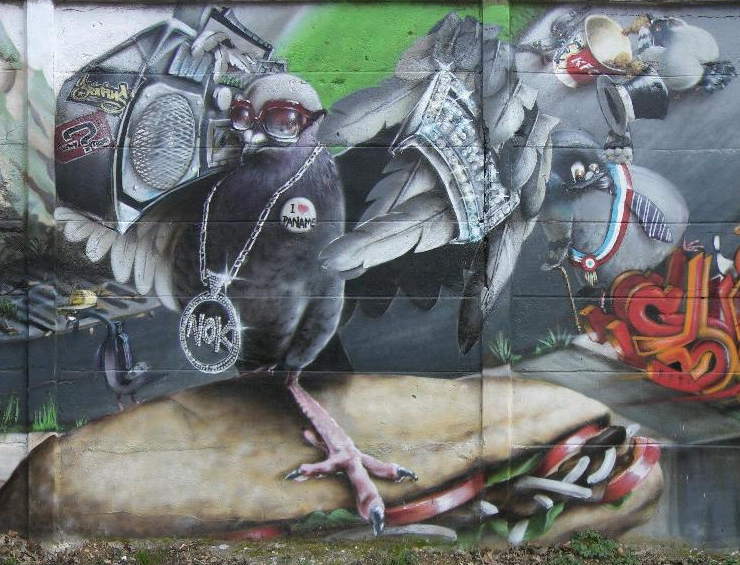 The only people likely to enjoy this artist’s work are people who cannot read, nor write in Russian. I can’t imagine seeing english text as stimulating. My mother has OCD – she is hyper-religious due to it, and constantly is either reading the bible, listening to her religious radio channel and/or writing religious notes. She also used to constantly record radio broadcasts on cassette tape. She has several baskets filled with them. When I brought a notebook computer to her house she was interested in learning to type on it so she could fill hard drives with the results of her graphomania. It made for an interesting childhood–especially as I am an athiest. this guy went nuts for sure!! hey guys!What are u talking about?i think it’s just sick all this.Definatly the author of all that is seriously ill. brrrr…this is crasy! Квартира Митасова. Харьков. Фото:Павел Маков. Mitasovs apartment. Kharkov. Photo by Pavel Makov. 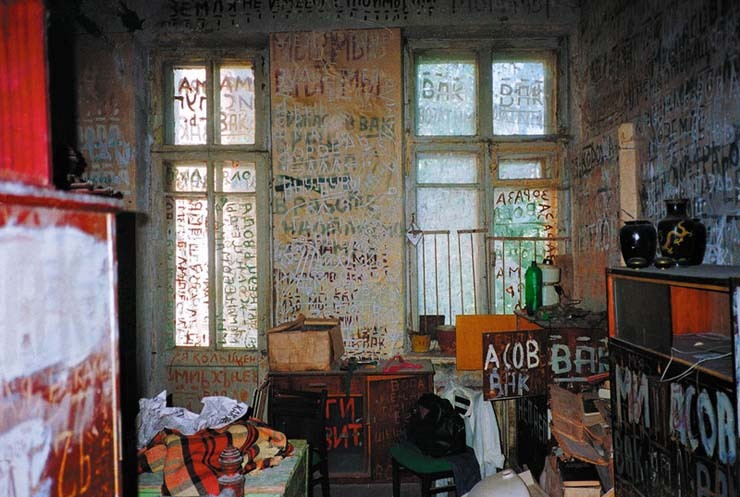 Mitasov was born in the middle of 20th century and died in psychiatric hospital in 1999. He had an university degree, was an economist, worked as stores head manager. 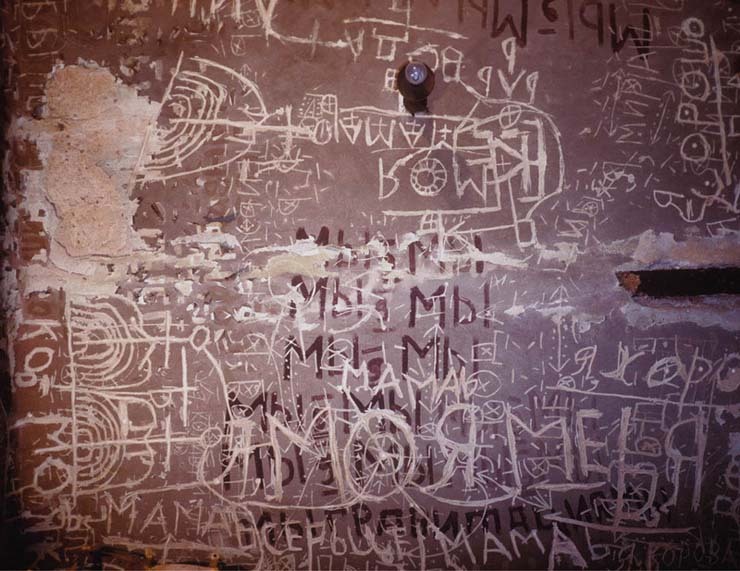 when he got sick,he covered everything with inscriptions in several layers. right now the apartment is all fixed up. but in the neighborhood you can still see some of his inscriptions. 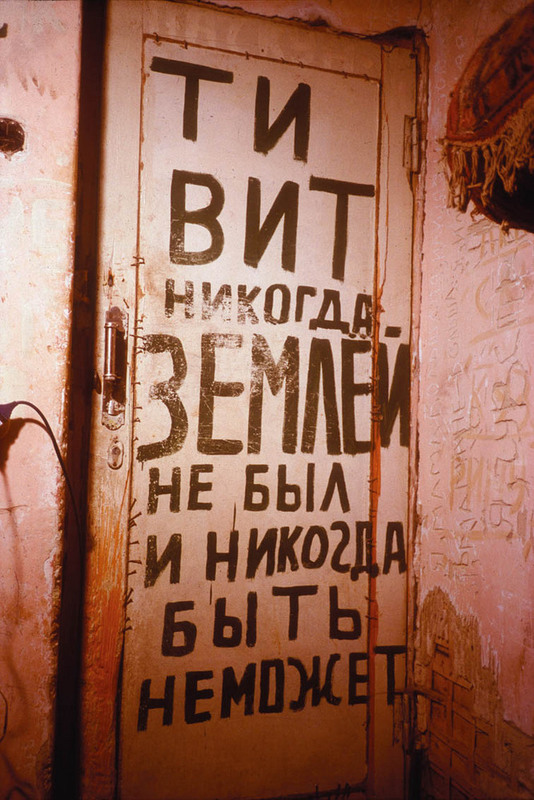 and the last one, one on the house, reads: My happiness, I am here and waiting for you. 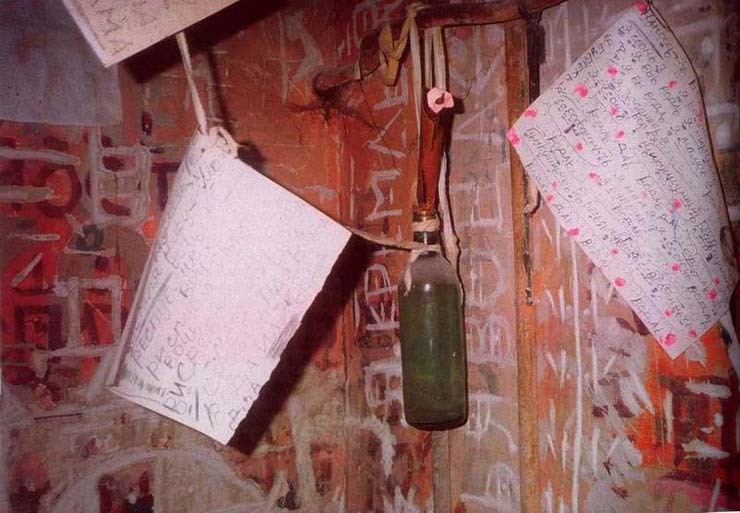 and by the way the writing on the door does not say anything about Tibet. two first words don’t make sense, but are very similar to *You were*, and if thats right, then all together it reads *You were never a ground(earth,soil,dirt), and never will be. I think that this is graffiti just because I think this mans obsessing over writing the scripture, I don’t think he is doing it for an aesthetic purpose or having any thought process behind it. But if I applied this same type of idea to a poster, i guarantee that I would get an A in my graphic design class. Wow, this is really typical of the situation in the 90ies, so many people went insane. For those who don’t understand: an educated and successful economist went bonkers and covered his whole flat with inane incoherent misspelled writings sometime in the 90ies, perhaps after loosing his job and all he worked for. Chto strashno eto to, chto ego kvartira bol’she chem moy v Moskve. Interesno, esli on by zahotel obmenyatsya. Безгранично полезная инфа, согласен с автором! I think he means to write. you will never belong or fit in. I think that’s what he means when he writes you will never be of the earth. I think it’s very sad. very nice, poor guy if he really got mad….